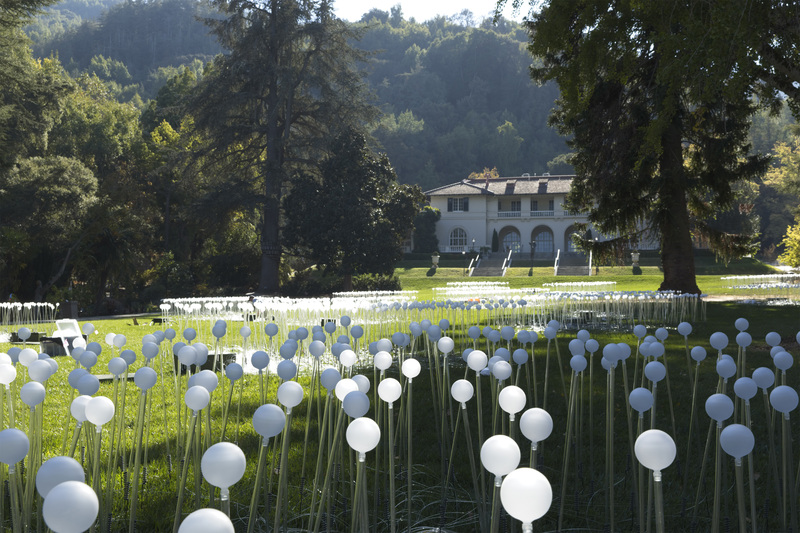 "Bruce Munro at Montalvo: Stories in Light" includes "Silver Sea," on display in the Great Lawn at Montalvo Arts Center, from October 28, 2018 through March 2019. "Silver Sea" takes its visual reference both from C.S. 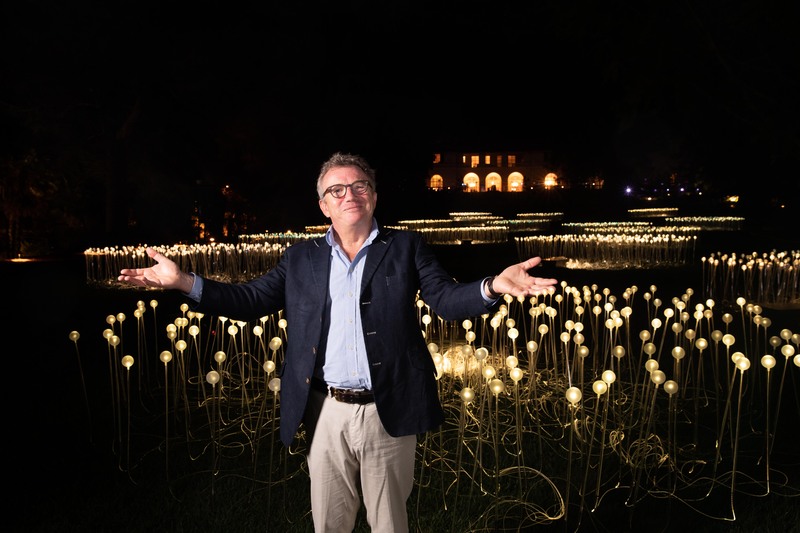 Lewis and from two previous installations by Munro: "Field of Light" exhibited at the Victoria and Albert Museum (2004) and "Lilies" exhibited at Longwood Gardens (2012). The artist plans to scatter Montalvo’s Great Lawn with clusters of “lilies” created from over 4,000 stems and spheres of light. 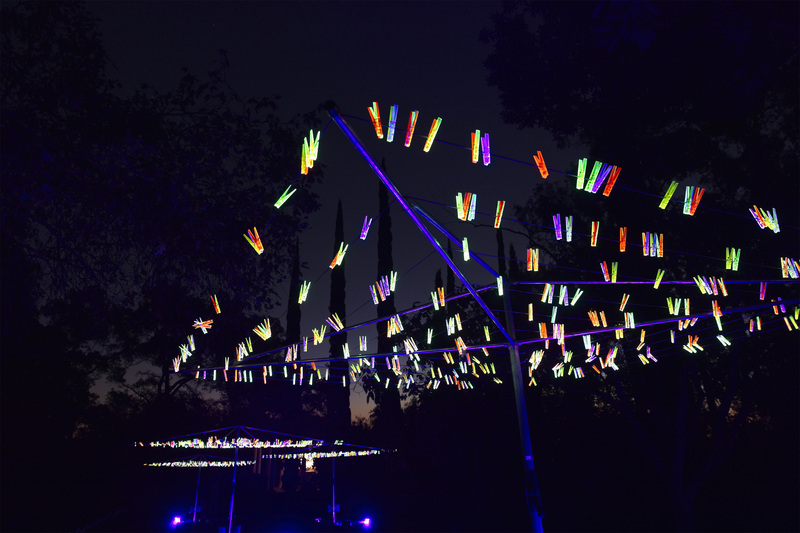 "Bruce Munro at Montalvo: Stories in Light" includes "Gathering of the Clans," on display in the Italianate Gardens at Montalvo Arts Center, from October 28, 2018 through March 2019. 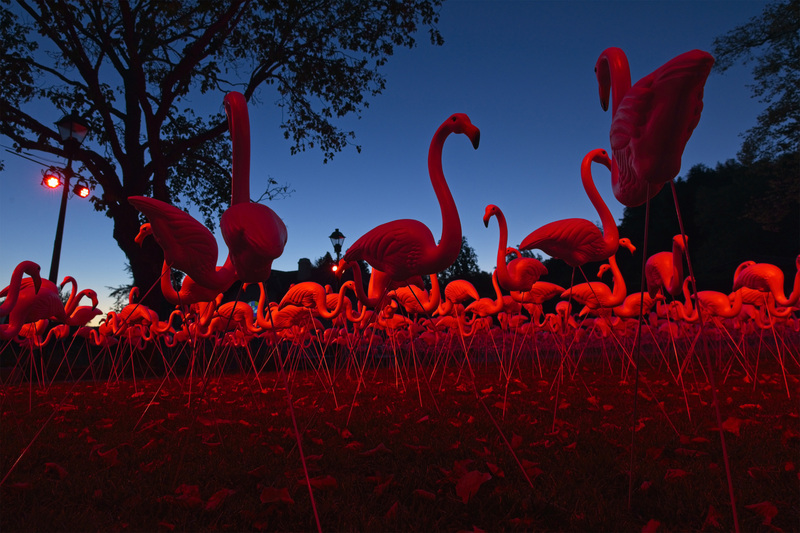 A veritable flock of psychedelic sound and illuminated color, this work is created out of hundreds of fluorescent clothes pins. It is inspired equally by the anthropomorphic animals from Narnia and the birds of Australia and incorporates a cacophonous soundtrack of the calls of wild cockatoos. 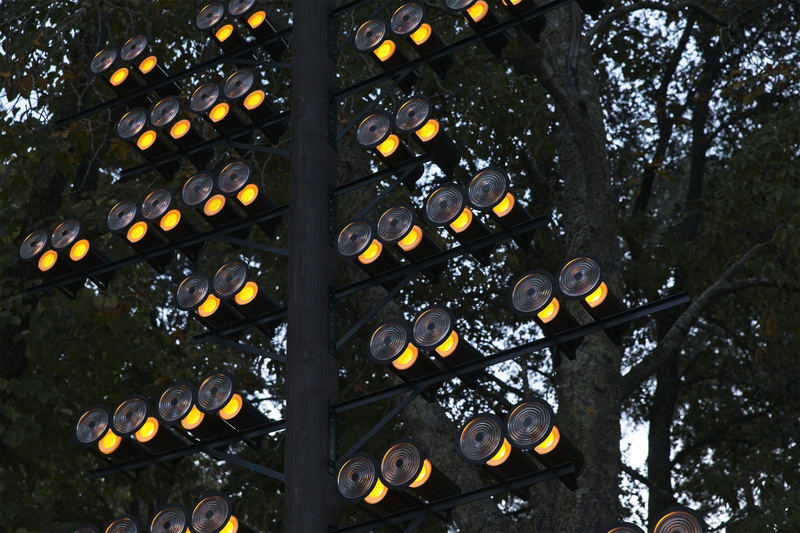 "Bruce Munro at Montalvo: Stories in Light" includes "Parliament of Owls," on display in the Linden Grove at Montalvo Arts Center, from October 28, 2018 through March 2019. Charmed by both the similarity between these glass lens and a caricature of an owl’s eye, and the term for a group of owls, Munro has created this installation in homage to a scene from Lewis’s book "The Silver Chair." 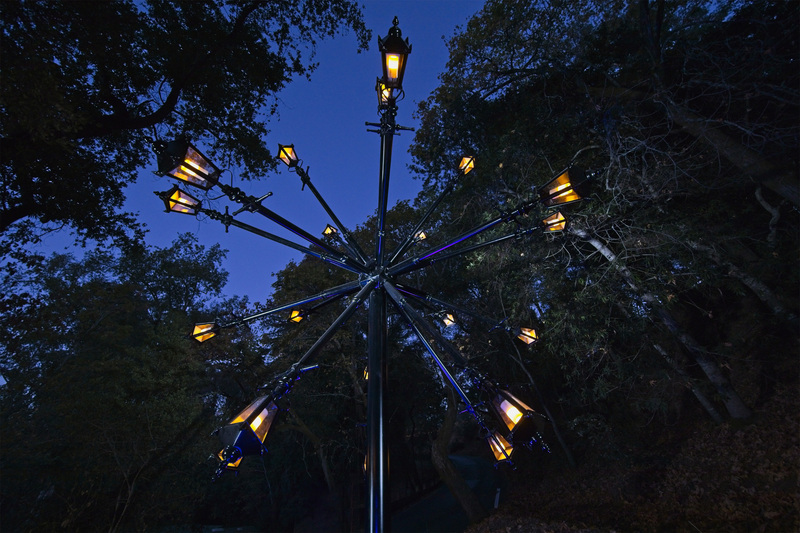 "Bruce Munro at Montalvo: Stories in Light" includes "The Good Seed," on display in the Switchback Trail at Montalvo Arts Center, from October 28, 2018 through March 2019. In C.S. Lewis' iconic "The Lion, the Witch, and the Wardrobe," a young girl named Lucy discovers a magical portal to another world called Narnia. This work is the artist’s homage to one of the enduring images from that book: an eternally burning Victorian iron lamppost in the middle of a silent snow-laden forest. 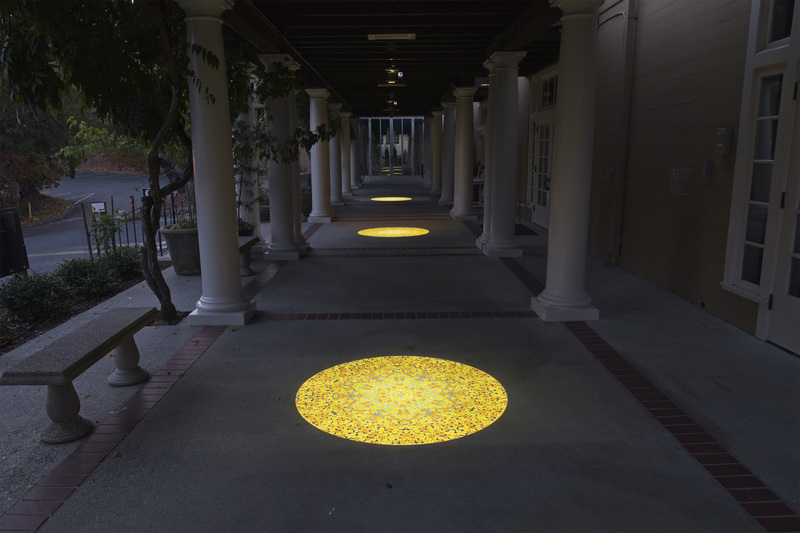 "Bruce Munro at Montalvo: Stories in Light" includes "Ramandu's Table," on display in the Garden Terrace at Montalvo Arts Center, from October 28, 2018 through March 2019. Inspired by a chapter of C.S. 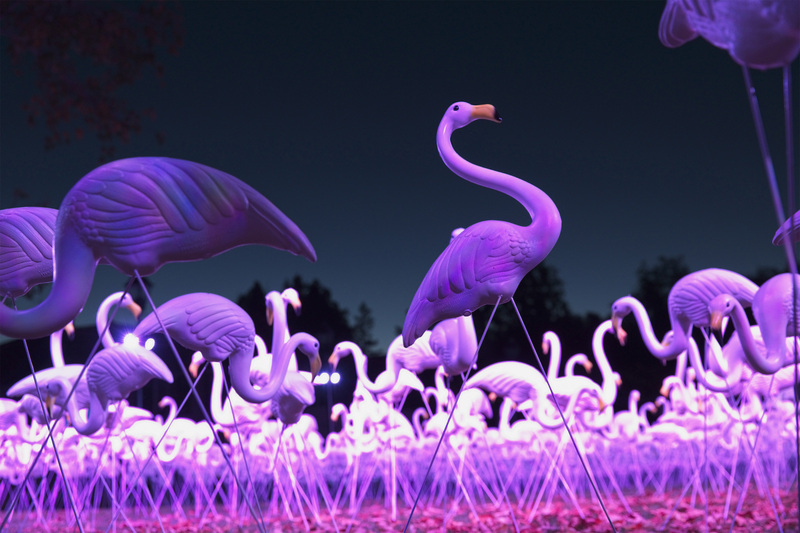 Lewis' "The Voyage of the Dawn Treader" in which a flock of white birds deliver a “sun berry” every morning to the star Ramandu, this installation features over 100 special edition white flamingos illuminated with an array of continually changing dawn colors. 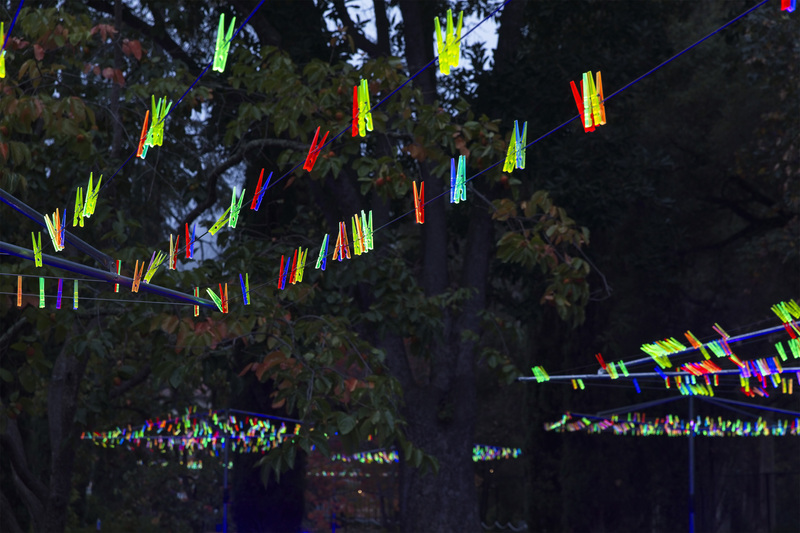 Bruce Munro at Montalvo: Stories in Light" includes "Ramandu's Table," on display in the Garden Terrace at Montalvo Arts Center, from October 28, 2018 through March 2019. 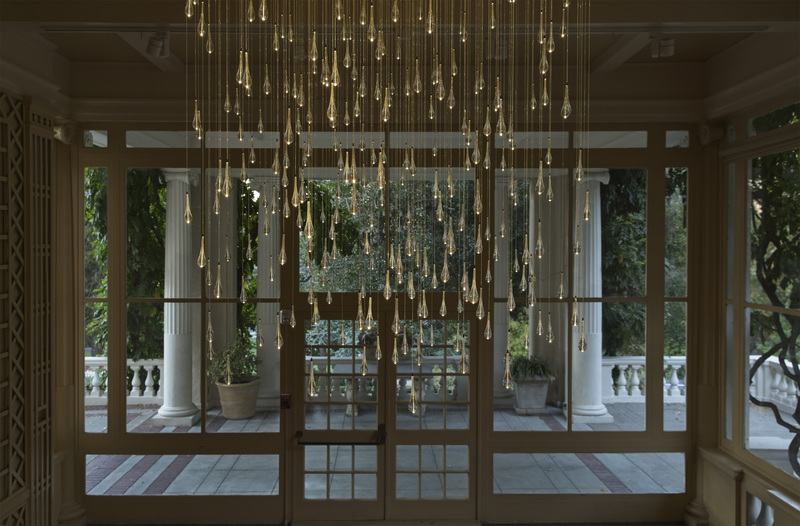 "Bruce Munro at Montalvo: Stories in Light" includes "Light Shower," on display in the Historic Villa's Solarium at Montalvo Arts Center, from October 28, 2018 through March 2019. 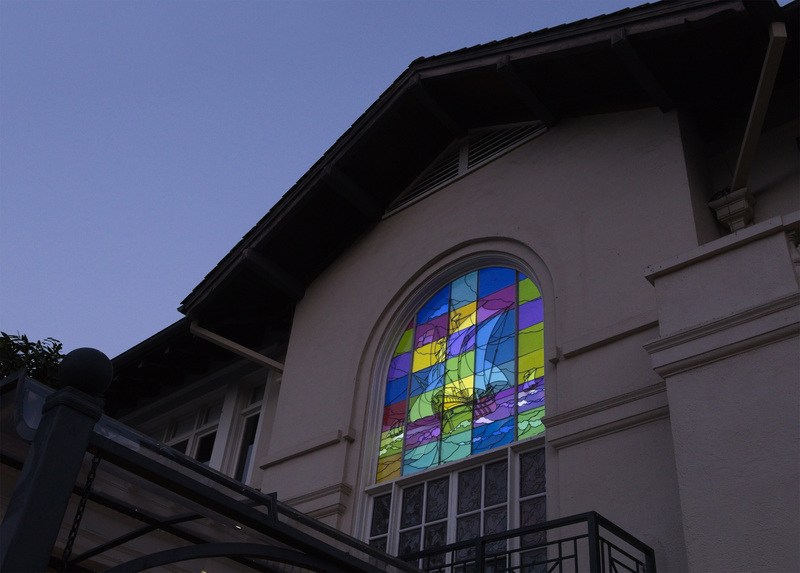 Munro created the first iteration of this work in 2008, inspired by rivulets of raindrops streaming down a window. By day, the installation gently catches glimpses of natural light. By night, it morphs into a shower of light dancing in harmony with the stars. 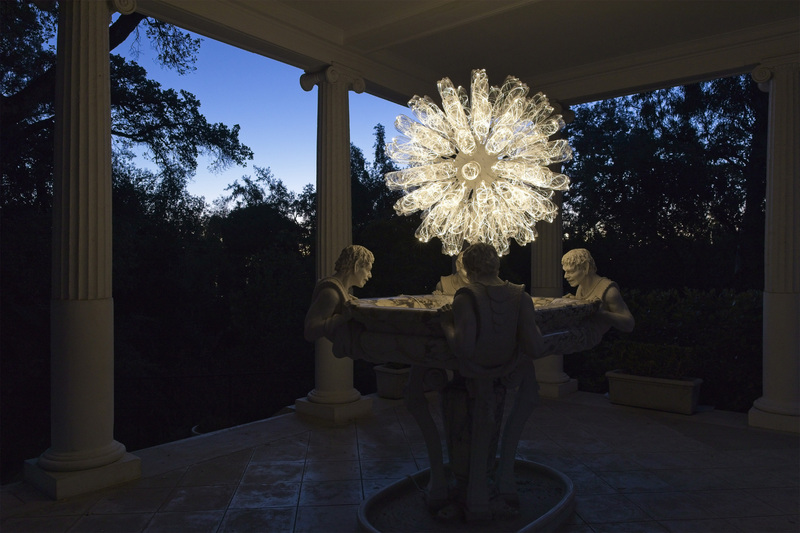 "Bruce Munro at Montalvo: Stories in Light" includes "Bacchus Spring," on display in the Italianate Gardens at Montalvo Arts Center, from October 28, 2018 through March 2019. Four heads of Bacchus (whose feats were part of the awakening of old Narnia in C.S. Lewis' "Prince Caspian") sit around the perimeter of a fountain in Montalvo’s Italianate Garden. Munro’s installation, a sphere created from recycled glass wine bottles threaded with optical fiber, creates an abstraction of an infinitely flowing wine fountain for the twenty first century. 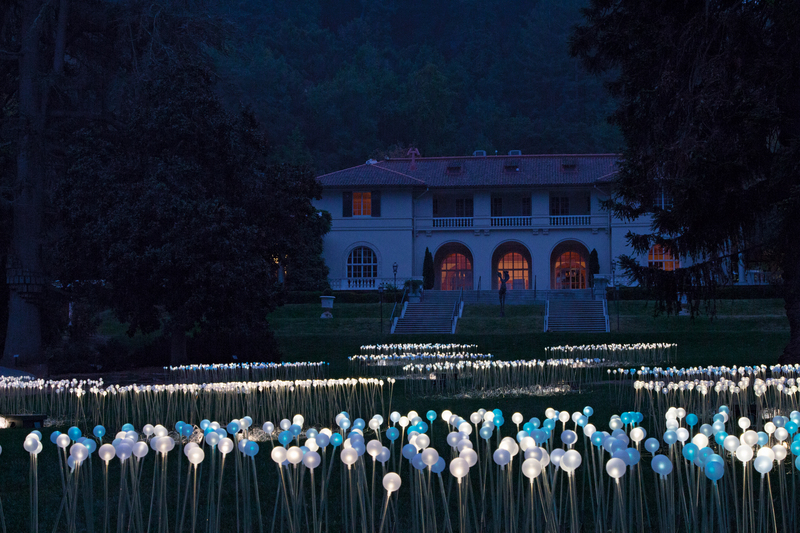 "Bruce Munro at Montalvo: Stories in Light" includes "Silver Sea," on display in the Great Lawn at Montalvo Arts Center, from October 25, 2018 through March 2019. "Bruce Munro at Montalvo: Stories in Light" includes "Reepicheep's Wave," on display in the Garden Theatre at Montalvo Arts Center, from October 25, 2018 through March 2019. This piece—created expressly for the Montalvo exhibition—features over 15,000 plastic mussel shells suspended on illuminated optical fibers. The inspiration comes from the last chapter of C.S. 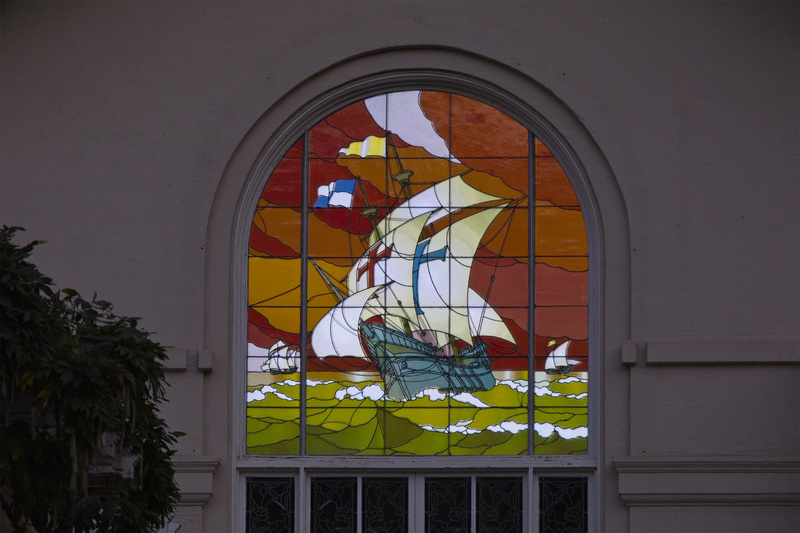 Lewis' "The Voyage of the Dawn Treader," where the galleon Dawn Treader sails into a freshwater sea of lilies from a saltwater ocean. 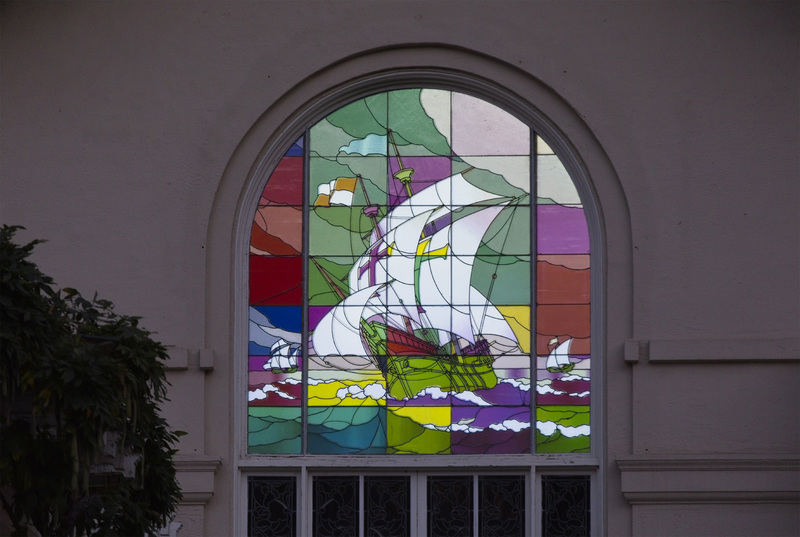 "Bruce Munro at Montalvo: Stories in Light" includes "Dawn Treader," on display in the Historic Villa at Montalvo Arts Center, from October 28, 2018 through March 2019. During Munro’s first visit to Montalvo, he was “bowled over” by the gardens and the historic Villa. 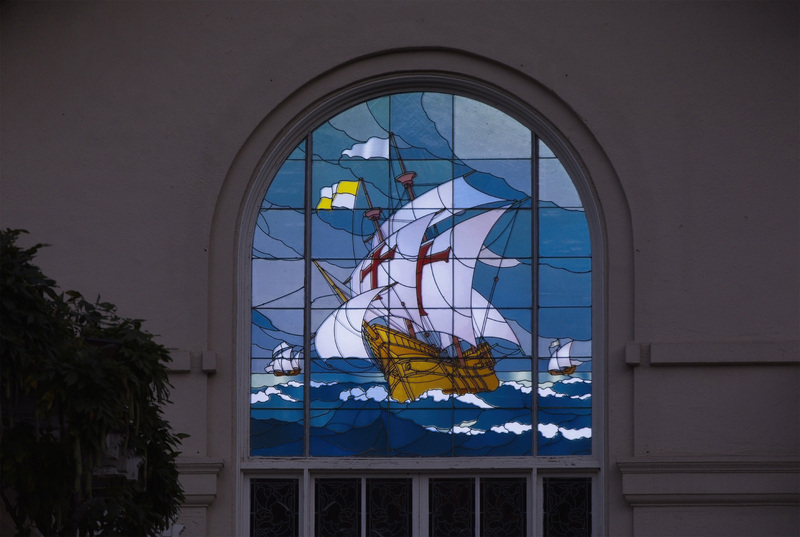 His aim with this installation is to illuminate this 106-year-old stained glass window so as to create the illusion of movement, highlighting the galleons as they voyage across C.S. Lewis’s mythological seas. 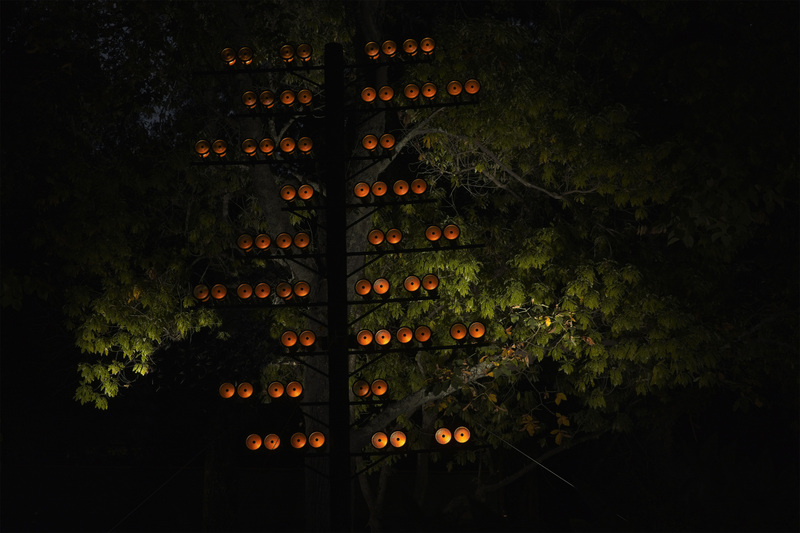 "Bruce Munro at Montalvo: Stories in Light" includes "Parliament of Owls," on display in the Linden Grove at Montalvo Arts Center, from October 25, 2018 through March 2019. 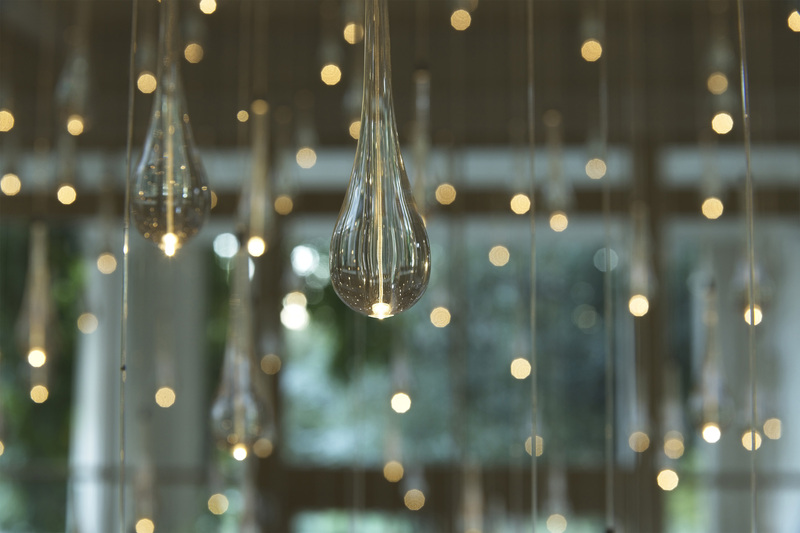 "Bruce Munro at Montalvo: Stories in Light" includes "Reflections/ Between Worlds," on display in the Pavilion at Montalvo Arts Center, from October 28, 2018 through March 2019. 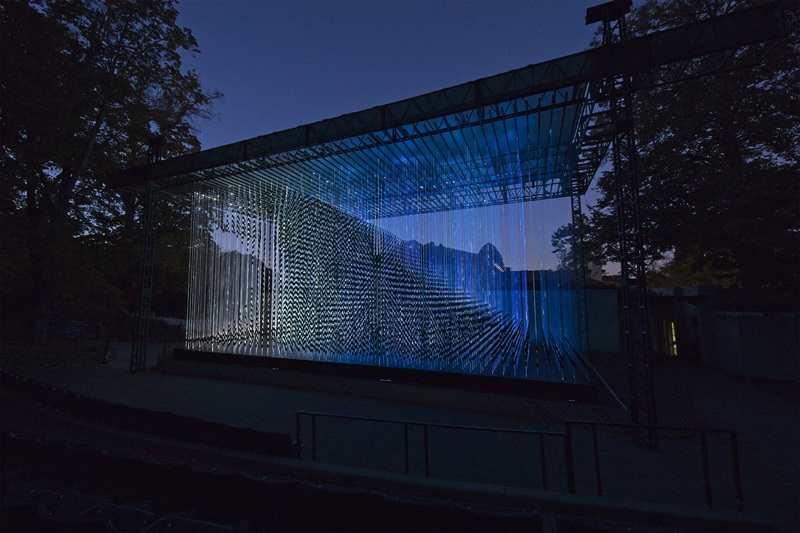 "Between Worlds" is a light projection that pays homage to a realm described in "The Magician’s Nephew": a soporific wood where the sunlight falls in dappled patterns on pools of water at the base of ancient trees. 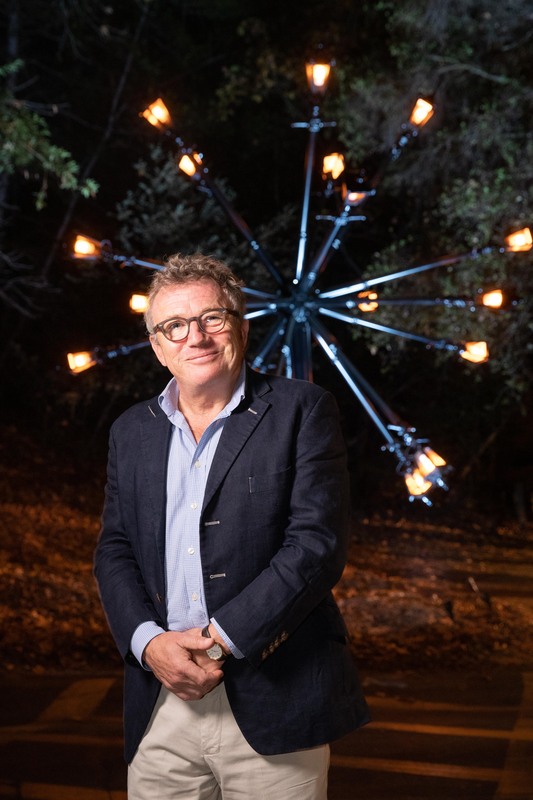 World-famed artist Bruce Munro with his installation "The Good Seed" at the opening of his world premiere exhibition at Montalvo Arts Center at a VIP preview. 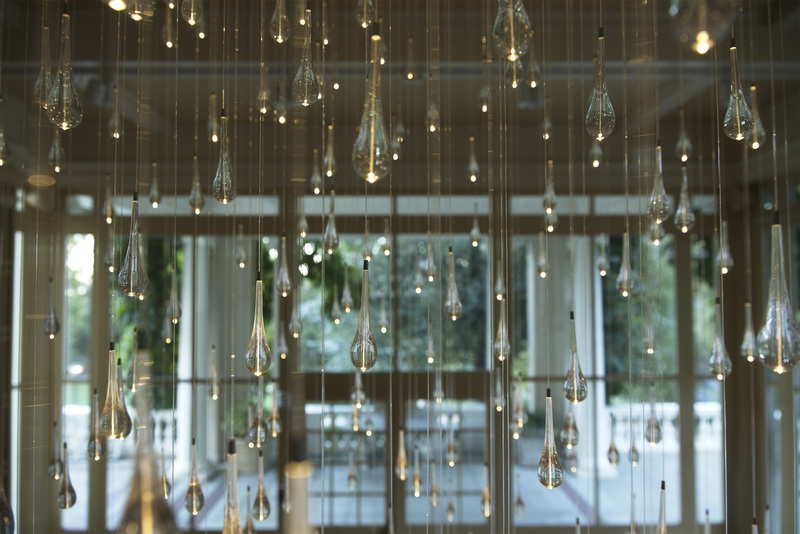 "Bruce Munro at Montalvo: Stories in Light" will be on display select nights through March 17, 2019. World-famed artist Bruce Munro with his installation "Silver Sea" at the opening of his world premiere exhibition at Montalvo Arts Center at a VIP preview. "Bruce Munro at Montalvo: Stories in Light" will be on display select nights through March 17, 2019.